Porcelain may be the first thing you think of for bathroom sinks. But think again: Our tests of eight materials found several that stood up to our barrage of everyday wear and tear even better than porcelain for about the same price. Also called lavatories, bath sinks include a dazzling array of choices. Vessel sinks, a modern twist on the original bowl and pitcher, sit on top of a counter or cabinet. You can also install the sink beneath the countertop for a sleek look that emphasizes the countertop itself. These undermount sinks are also easy to clean since there’s no lip to catch debris. Best of all, you don’t have to follow yesterday’s rules when it comes to design. One example: The sink, tub, and toilet no longer have to be the same or similar material and color, notes Diana Schrage, senior interior designer for Kohler. Instead, more designers are deliberately making the sink stand out so it acts as a focal point for the room. Popular picks can be damage-prone. Also known as vitreous china, porcelain as well as fireclay, solid surfacing and enameled cast iron, all dented, dinged, or chipped slightly in our impact tests, where we drop a small steel dart from a height of 20 inches—similar to what could happen if a pair or scissors or nail clippers fell out of your medicine cabinet. The tempered glass sinks shattered into small shards. The acrylic sinks didn’t chip, but they did melt slightly when we “accidentally” left a hot curling iron on them, leaving a visible mark. While solid-surfacing sinks were also damaged in our burn test, it was barely noticeable. Tip: If you’re choosing a white sink, from one brand and a white toilet, tub, counter or tile from another brand, compare the shades of white to make sure they look good together. If one is significantly “whiter” than the other, it can make the darker shade of white look dirty. Enamel vs. enamel. Want to go beyond basic white? Enameled sinks come in bold colors, earth tones, and even shades of gray. What’s underneath the enamel is crucial. Enameled steel withstood scratches, heat, sharp impacts, and most stains, but enameled cast iron wasn’t as good at resisting stains, and chipped when small objects were dropped on it—though it did fare better than enameled steel under heavier dropped objects. Chipped enamel can cause the metal underneath to rust over time. Tip: A highly patterned stone countertop works best with a simple, solid-colored sink, and vice versa. Allow one element to be the star, the other to play a supporting role. Super bowls.Stainless-steel sinks are increasingly popular in the bathroom and top our Ratings. They fended off stains from common cleaning products and drain cleaner, and also resisted heat, dents, and dings. Contrary to what some manufacturers claim, we found that gauge, or thickness, made little difference. We tested 18- to 23-gauge sinks; the lower the gauge the thicker the steel. To minimize the noise of running water, select a sink with sound-absorbing pads attached to the exterior’s bottom or sides instead of a spray-on coating. 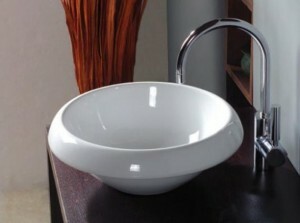 Sinks with polished or glossy surfaces showed scratches and stains more than those with matte or random grain finishes. Tip. Unusually shaped sinks may limit which faucet you choose and where you place it. 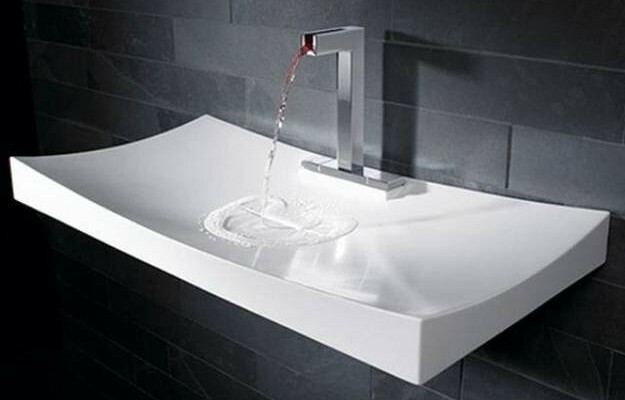 Vessel sinks may need a wall-mounted faucet or a countertop-mounted faucet with a spout that’s tall enough to reach over the sink. Master baths are the second most popular room to redo, after the kitchen. So this is where to treat yourself. Stick with a sink that can take wear and tear for a child’s or frequently used bathroom. For a guest bath or powder room, where storage isn’t as crucial and space is tight, a pedestal or wall-mount sink will work. The latter can be installed to any height, making it a good option for tall, short or disabled people. You can use drop-in sinks, which fit in a hole in the counter, and vessel sinks, which sit on top of the counter, with any countertop material. Just be sure overall height of the vanity plus the vessel sink isn’t too high. Under-mount sinks require waterproof countertop materials, such as stone or solid surfacing. Seamless installations, where the sink and the counter are made of the same material, have a nice clean look. But because they’re made as a unit, if the sink or counter is damaged, you’ll have to replace both. Figure out the faucet. Check how many faucet holes the sink has and where they’re located. If you’re keeping your current faucet, the sink will need to have the same number of faucet holes as the sink you’re replacing, or you’ll need a decorative plate to cover the extra holes. Sinks without faucet holes usually require holes in the countertop or a faucet that’s installed on the wall. Regardless, the water should flow to the bottom of the sink—hitting the sides can cause splashing. To find out how all the materials fared in our tough tests, see our sink guide. And take a look at our free faucet-buying guide for information about finishes that performed well in previous tests. This entry was posted in Blog and tagged acrylic sinks, bathroom remodels, Enameled sinks, glass sinks, modern bathroom sinks, new bathroom sinks, picking out bathroom sinks, porcelain sinks. Bookmark the permalink.